In early August 2016 I went to Hachijo Jima, an island about 300 km South of Tokyo to look for bio-luminescent fungi. During the day I was hoping to find some Cordyceps. There were not too many fungi fruiting any more. We were told mushrooms are more abundant in June and early July, in the early phase of the summer monsoon. Every time we went looking for mushrooms I found one or two specimens of Ophiocordyceps yakushimensis right in the beginning and then no more Cordyceps for the rest of the day. However, the specimens we found were very interesting for several reasons I'll show below. 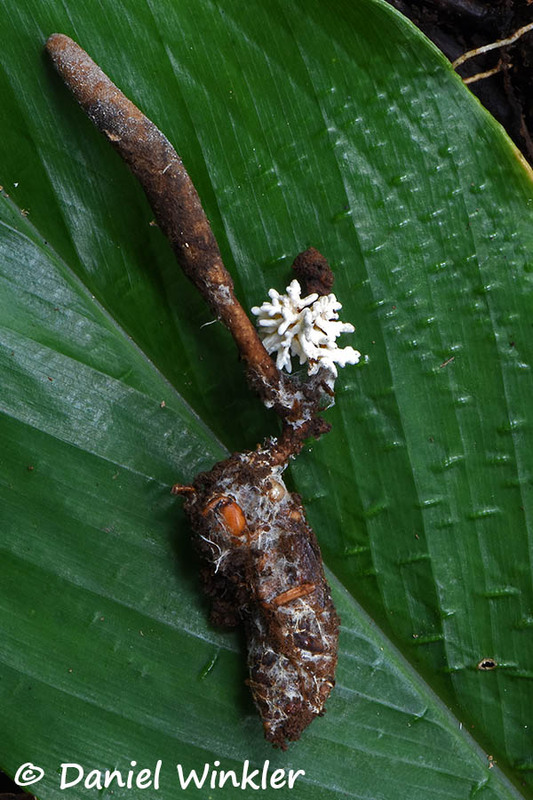 Ophiocordyceps yakushimensis is a cicadae parasitizing cordyceps. Note both specimens have secondary white fruitings. the older specimen on the right has some other kind of white fruiting fungus on the broken off, decaying stroma (more details on the enlargements below). Out of the top of the head of the cicada nymph grows the teleomorph, the white anamorph structures seem to grow out of several places around the head and thorax. Note the cavity, in which I found the parasitized nymph. 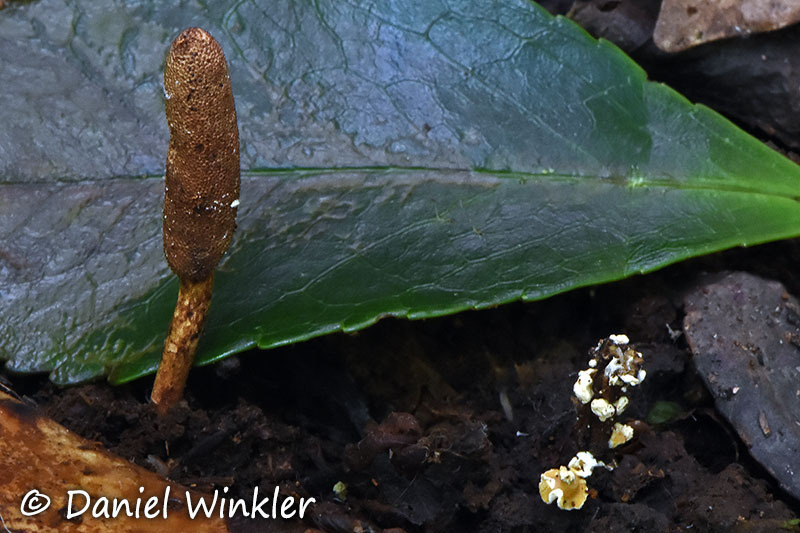 Mature fruiting bodies of Ophiocordyceps yakushimensis with an anamorph on the base. 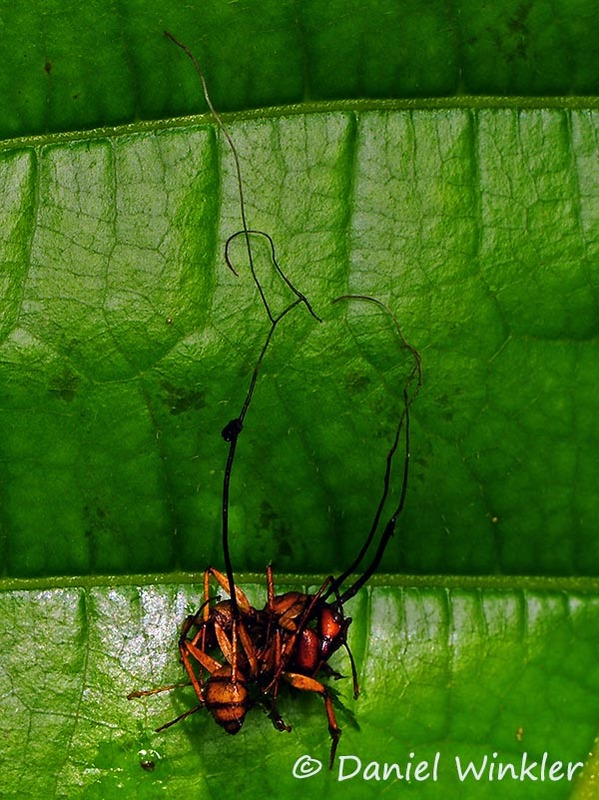 The cicada nymph host and the parasitizing Ophiocordyceps yakushimensis-teleomorph/anamorph fungus complex presented on a leaf. 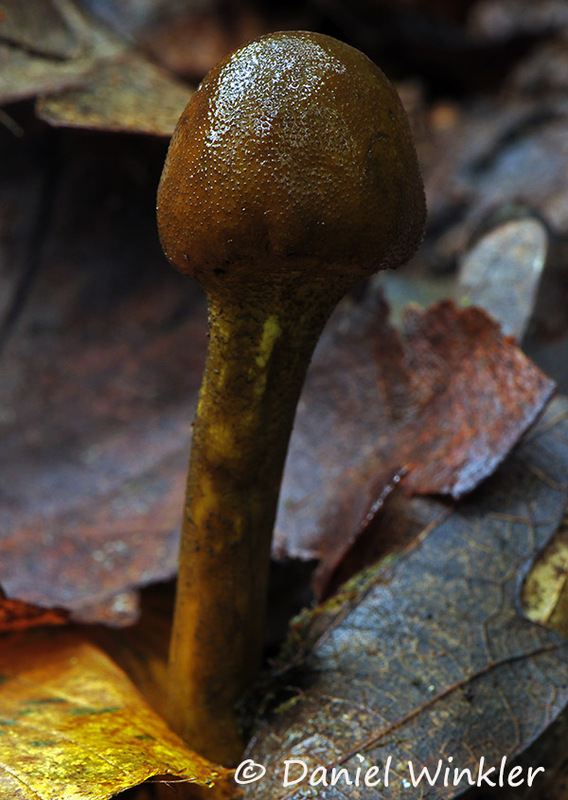 The anamorph of Ophicordyceps yakushimensis growing out of the base of the teleomorph of O. yakushimensis. 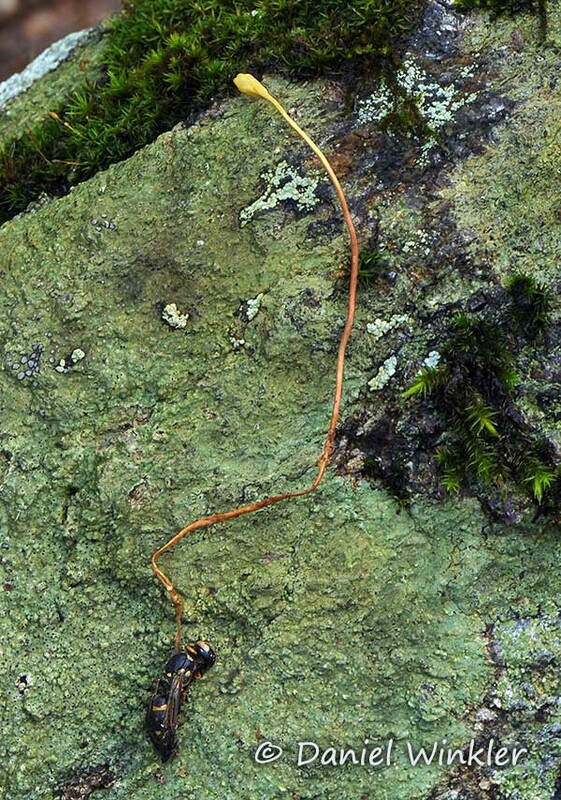 If I understand Shigeo Ootake correctly, in other locations in Japan, where this Cordyceps is found, the anamorph does not develop as nicely as in Hachijo Jima . If you like to see ascospores, conidia etc. of O. yakushimensis check the very interesting blog entry of out Shigeo Ootake-San. 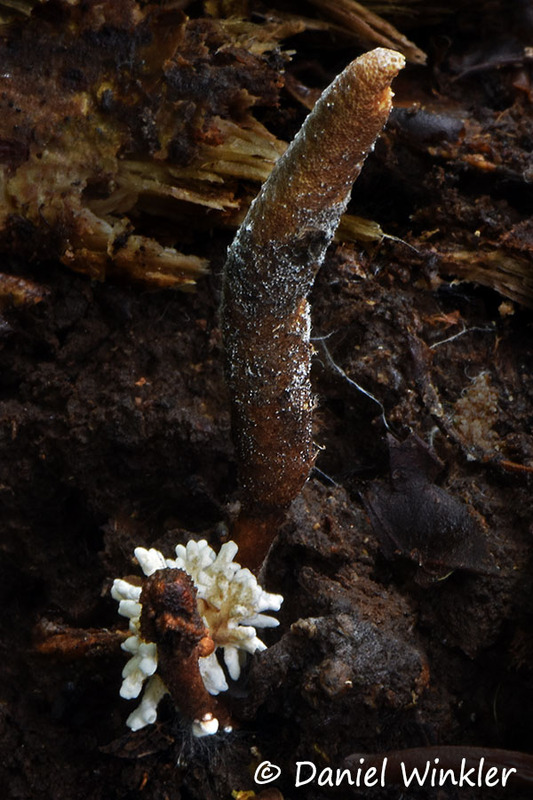 An over-mature stroma of Ophiocordyceps yakushimensis with a white fruiting that looks like a secondary parasite to me. Close up of the rotting and heavily parasitized stroma (If you should have an idea what I found, please let me know). 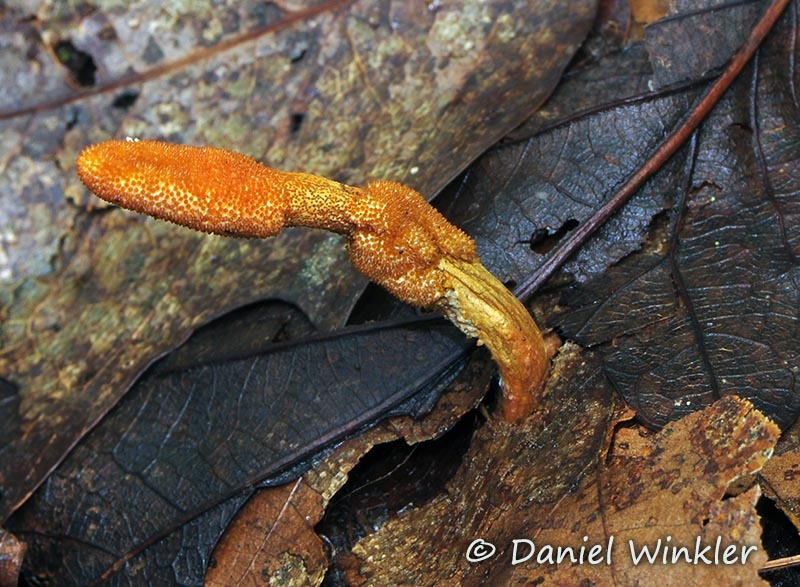 Probably an Isaria tenuipes (= I. japonica), which would be the anamorph of Cordyceps takaomontana. Interestingly, it was suspended in the air. 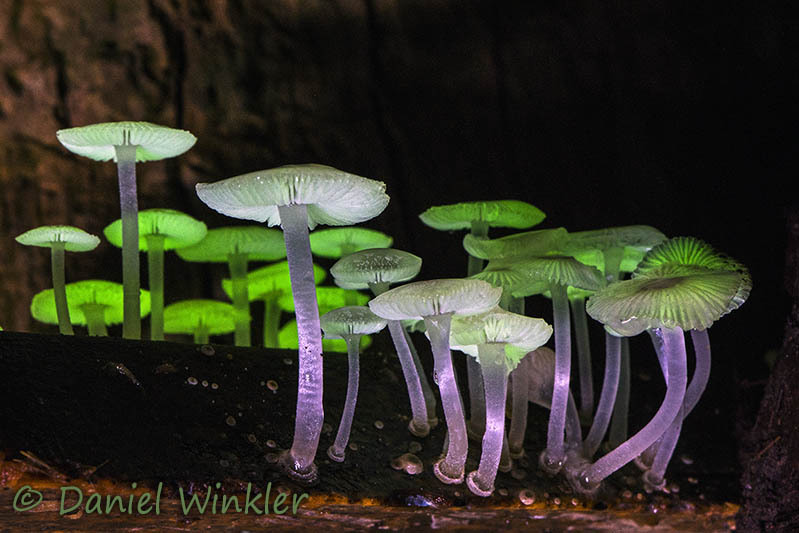 Mycena chlorophos, a bioluminescent mushroom. I went to the island to find these gorgeous mushrooms. The photo is taken in the dark with a tiny bit of light from a flash light, which produced the purplish hue. The bio-luminescent light emitted is greenish. Sorry there are no bio-luminescent Cordyceps fungi! Much more on the subject and many more images can be seen on my Mushroaming blog. Acknowledgements: Special thanks to my friend Ikuko Okuyama who helped me make my dream come true. PSMS Monthly Meeting, Tuesday June 14, 7:30pm - Doors open at 6:30 pm at the Center for Urban Horticulture (directions). 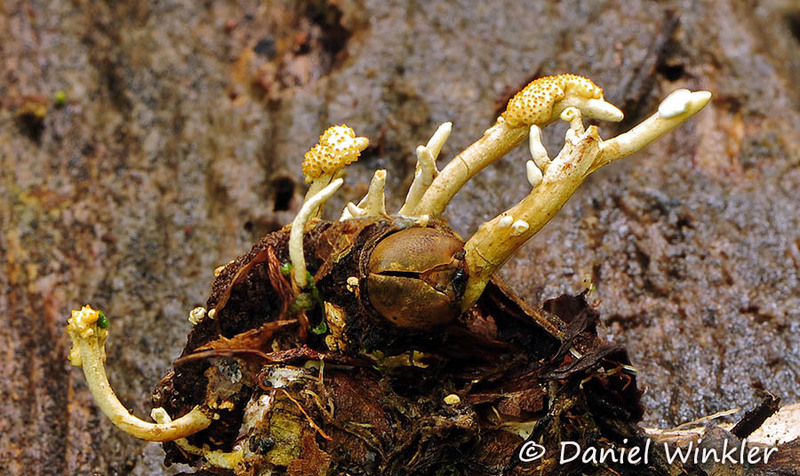 Cordyceps are bizarre club fungi which parasitize a wide range of insects and spiders as well as false truffles. 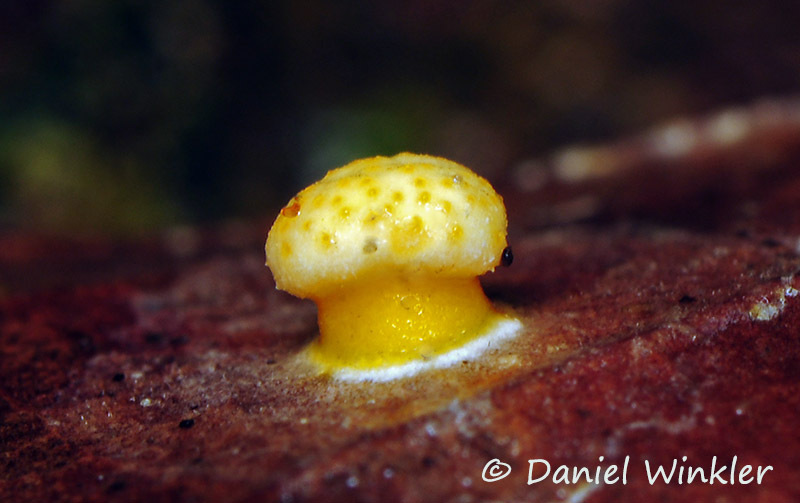 In the neotropical rainforest many display bright and vibrant colored fruiting bodies emerging from the leaf litter or decaying logs. Others are hidden away, attached to the underside of leaves. 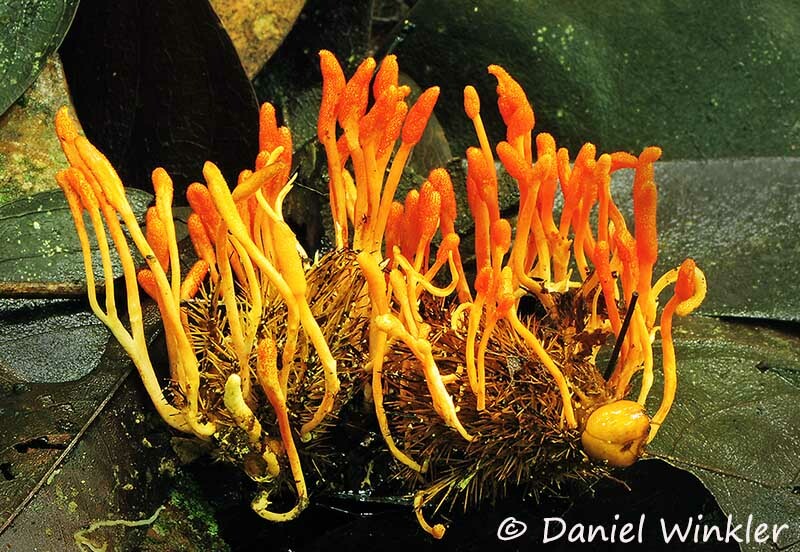 For understanding Cordyceps it is crucial to uncover and identify the host. 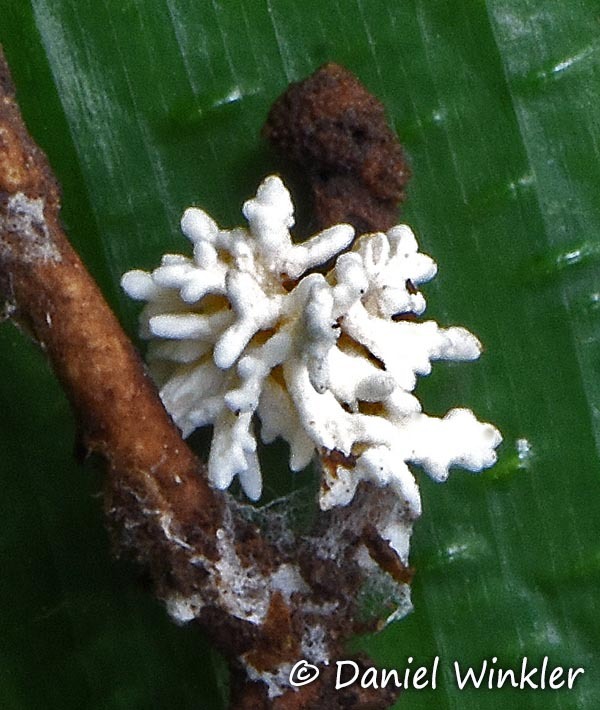 Most of Cordyceps' life cycle takes place inside the host. After infection the fungus manipulates arthropod behavior, basically creating a zombie that moves to a location to die for optimal spore dispersion so the next victim is easily reached. This has recently been proven in the case of carpenter ants in Thailand and such behavior was also observed by some Amazonian Indians in crickets, beetles and even spiders since ancient times. 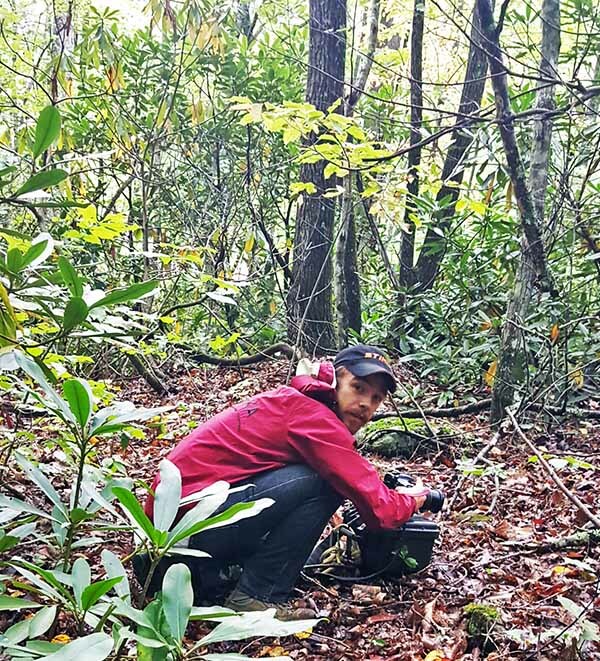 Hearing those stories from her Colombian professor who had traveled with the famous American ethno-botanist Richard Schultes through Colombian jungles arose her interest in studying Cordyceps and its relationship with its host insects. 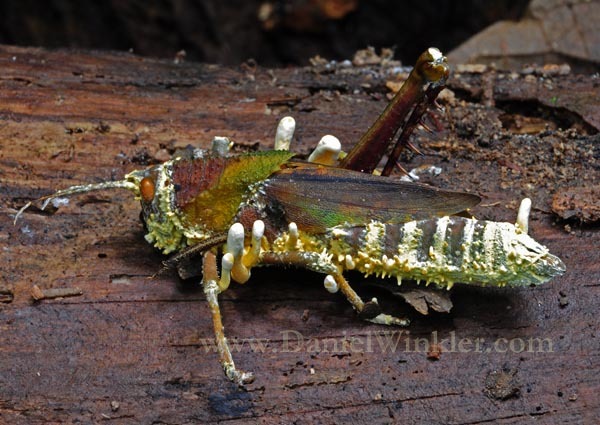 For almost twenty years she has traveled across the jungles of Colombia, Ecuador and Brazil collecting, identifying and describing new species of Cordyceps. In this talk she will share with us the diversity of neotropical Cordyceps and fascinating indigenous stories regarding Cordyceps and its relationship with insects and spiders and analyzing these folk stories in the light of the scientific theories. Tatiana Sanjuan holds a PhD in Biology from Antioquia University in Medellin, Colombia. 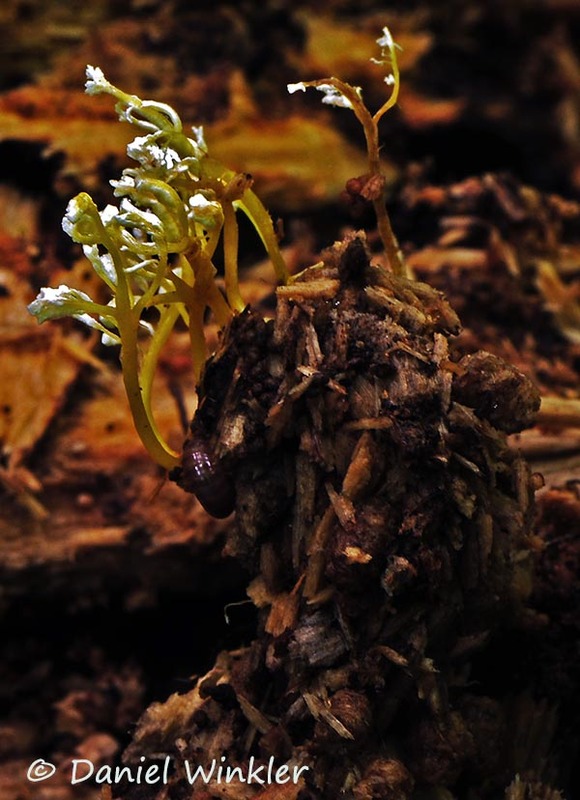 For almost 20 years her research has focused on the entomopathogenic fungus Cordyceps s.l. in the Amazon and other tropical rainforests. She started her research when she learned of the indigenous Amazonian myth about zombie bullet ants, the liana called "Yare" and Cordyceps. 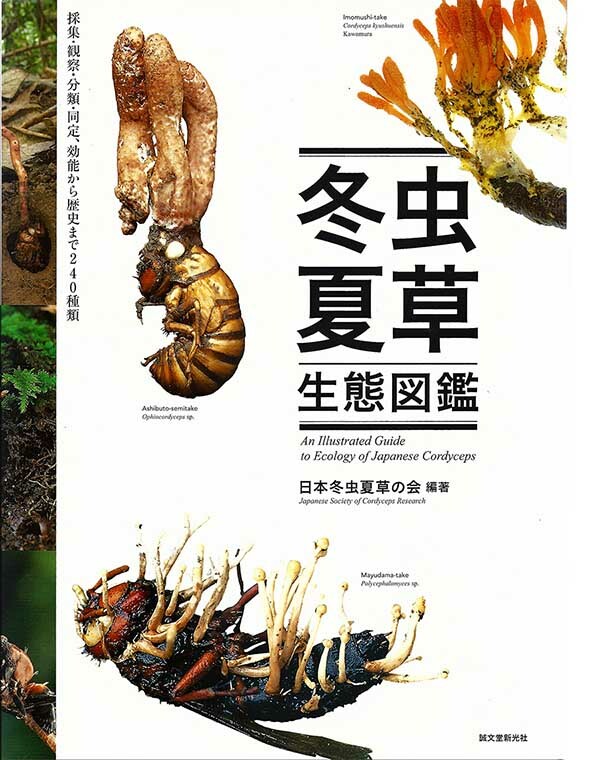 In her postgraduate research she published 5 articles describing 8 new species of Cordyceps s.l. from the Amazon and their relationships with their respective hosts. Currently she is working on the pharmaceutical potential of a new species of Cordyceps which parasitizes Tarantula spiders. Tatiana is also planning on giving a talk in Vancouver BC at UBC on Friday evening, June 17. Cordyceps acridophila T. Sanjuan & A. E. Franco-Molano, Mycologia 106 (2): 268 (2014), a grasshopper parasite we found in February 2012 in Madidi National Park, Bolivia in 250 m asl. 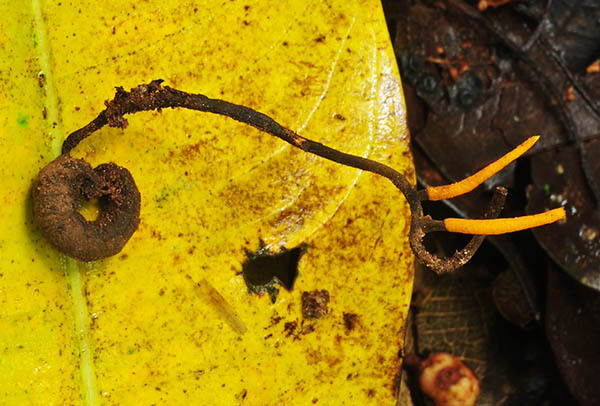 Ophiocordyceps evansii, a new species parasitizing neotropical Pachycondyla ants recognizable by its capitate stroma with erumpent ostioles. Specimen depicted found in Leticia, Colombian Amazon, April 16, 2016 in 75m asl. Reference: Sanjuan, T. I., Franco-Molano, A. E., Kepler, R. M., Spatafora, J. W., Tabima, J., Vasco-Palacios, A. M., & Restrepo, S. (2015). 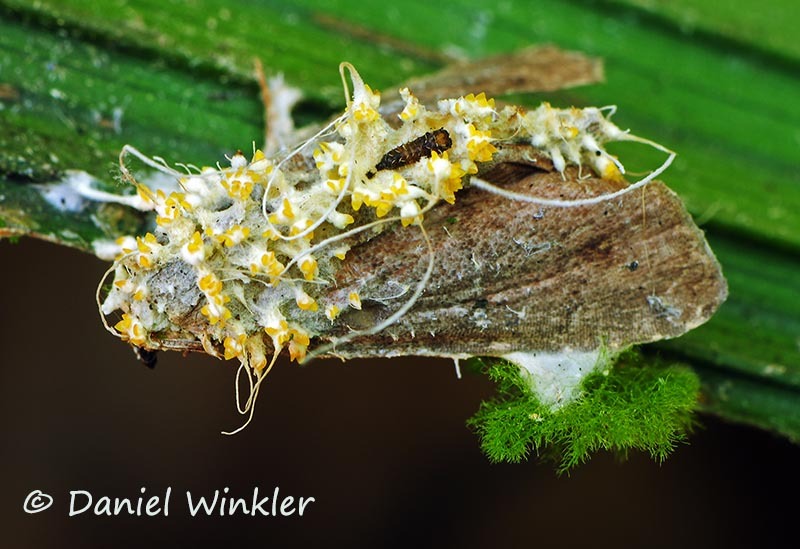 Five new species of entomopathogenic fungi from the Amazon and evolution of neotropical Ophiocordyceps. Fungal Biology, 119(10), 901-916. 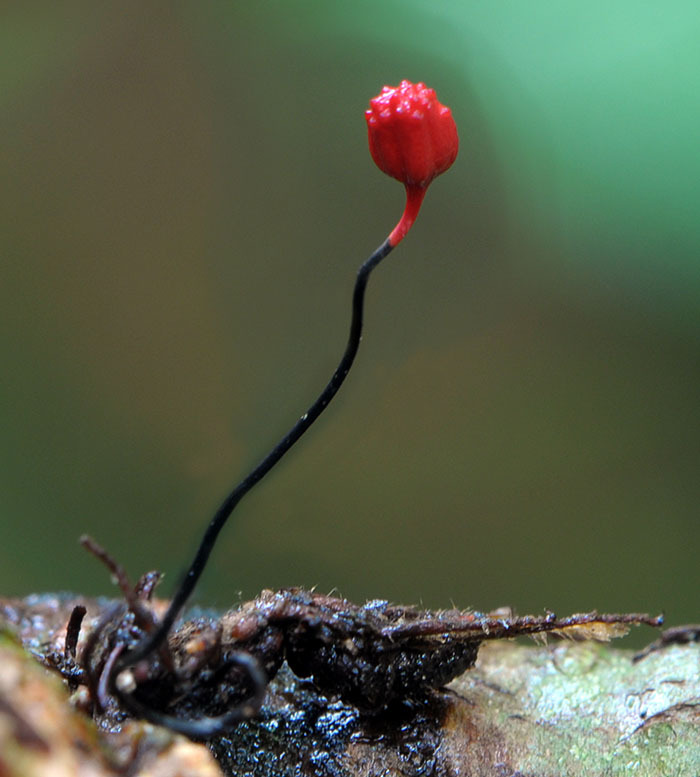 Ophiocordyceps tiputini sp. nov. with yellow ascomata and branched blackish stroma on Megaloptera larva. 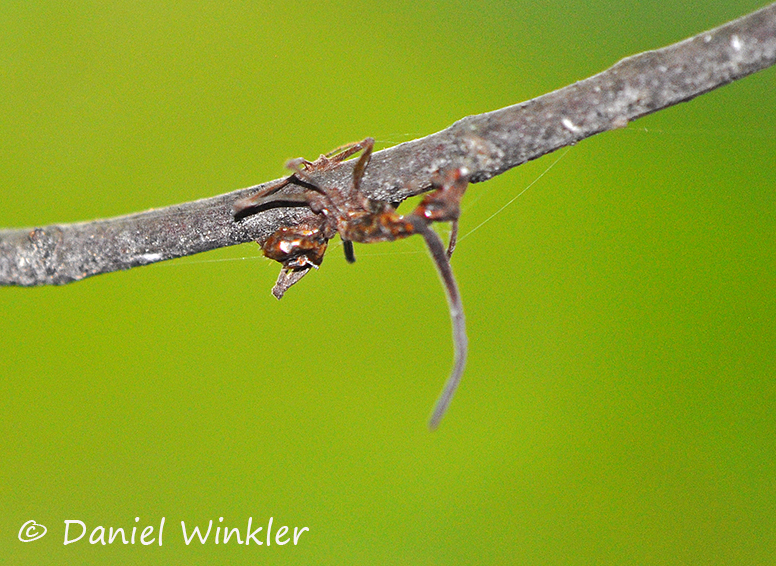 Found in Mashaquipe, Madidi National Park, Boloivian Amazon, Feb. 2013. 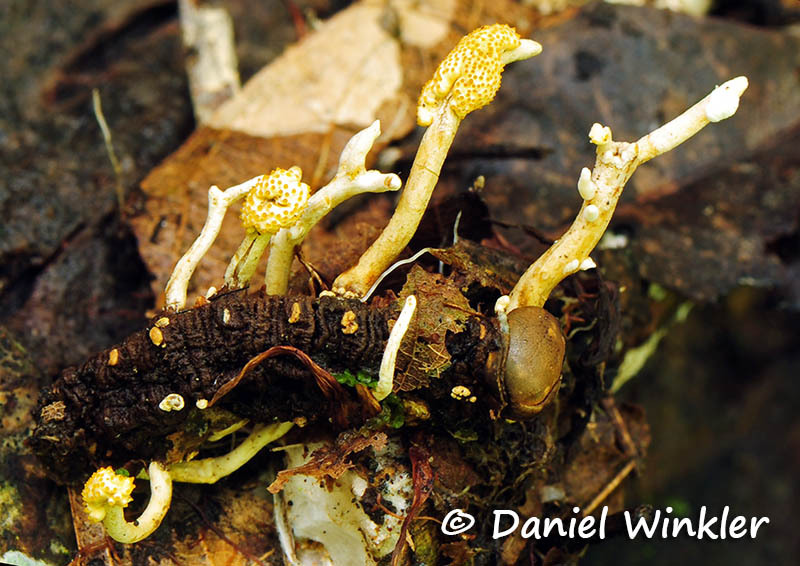 During the 2015 NAMA Foray in late September in Asheville, North Carolina, I ran into some nice Cordyceps specimens although the forests were quite parched. I was lucky that Todd Elliott showed me around and his friend Armin Weise took me to a forest that had above average moisture and we found 7 Cordyceps specimens of 3 different species within an hour! Included are a few more Cordyceps specimens from South Carolina a few days earlier I found with Tradd and Olga Cotter from Mushroom Mountain. I also uploaded my favorite photos of "regular" mushrooms from that trip on my Mushroaming blog. 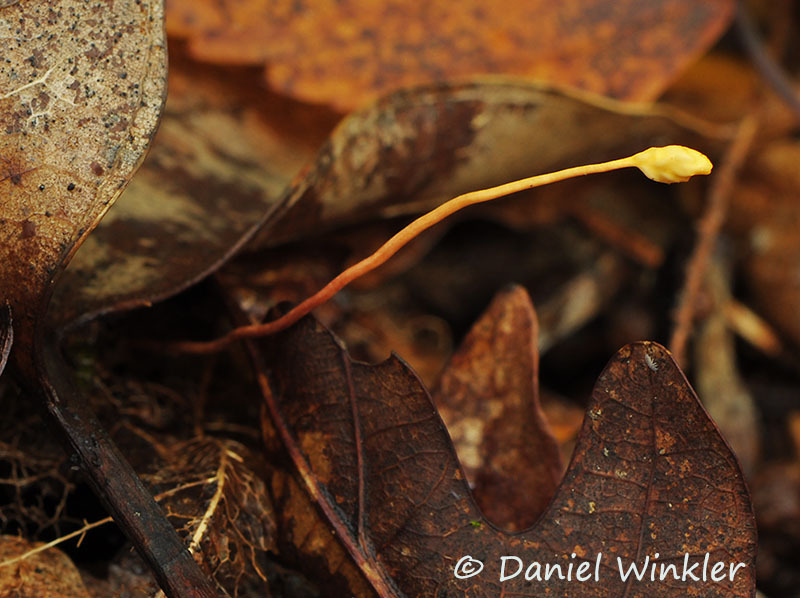 Fruiting body of Ophiocordyceps sphecocephala growing from between leaves on the ground. Luckily it is bright yellow. 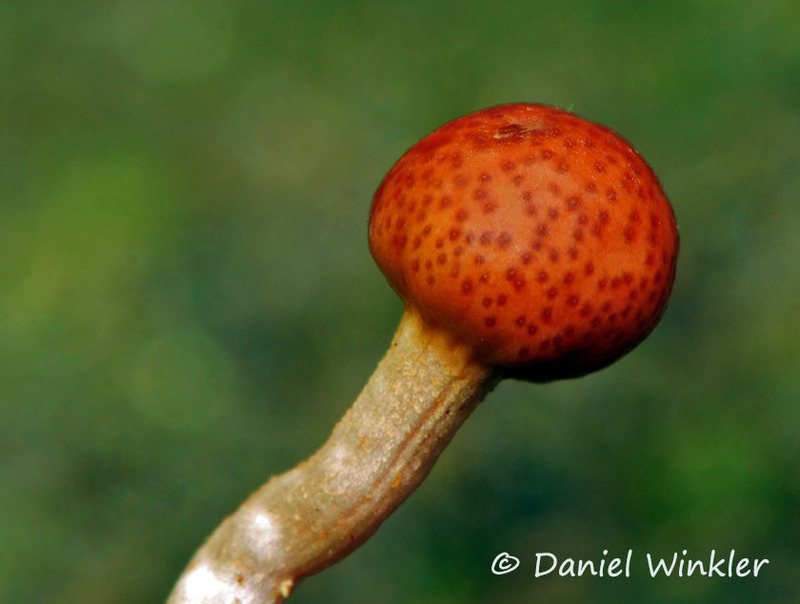 If the stroma was brown, it would be next to impossible to find this elusive tiny fungi. 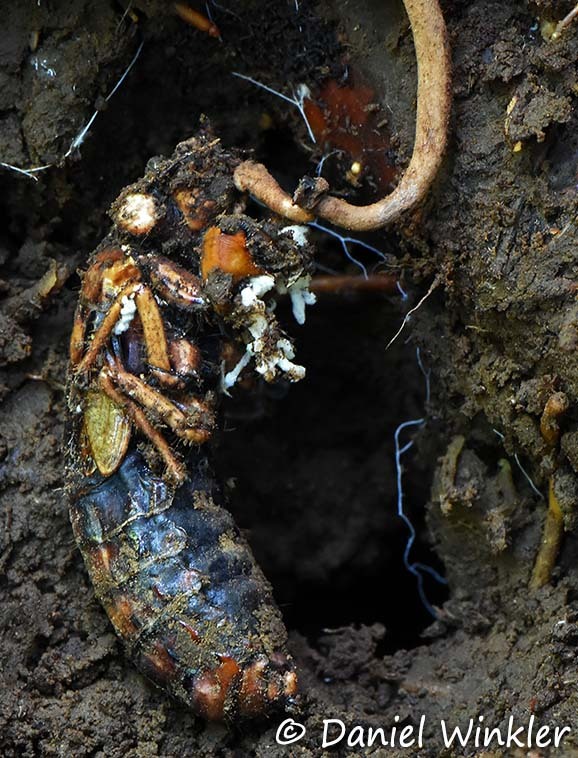 Here the carefully dug out insect-fungus complex. The stroma is so long since the leaf litter was so deep. Close up of the dead wasp. 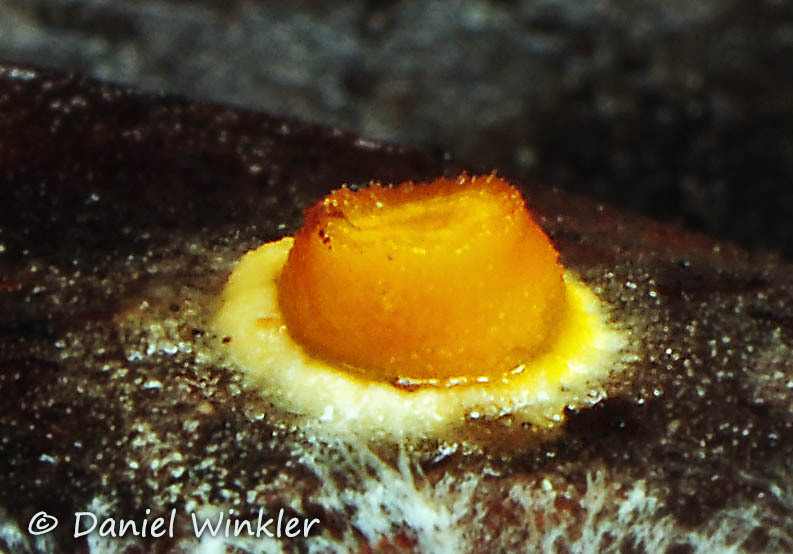 Inside is only mycelium of Ophiocordyceps sphecocephala left. The fungus probably leaves the exoskeleton in good shape to protect itself from other parasites while digesting the wasp. A somewhat battered Scarlet Caterpillarclub - Cordyceps militaris. It seems like something broke the immature stroma and thus the perithecia only developed in non-impacted areas. 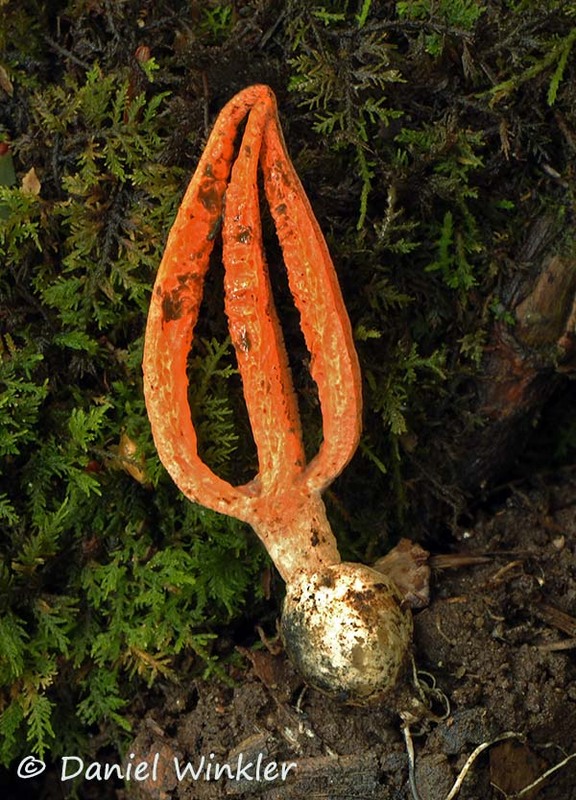 The anamorph of Cordyceps tuberculata, formerly known as Akanthomyces pistillariformis. C. tuberculata and A. pistillariformis are the same organism, but manifesting different reproductive pathways. C. tuberculata reproduces sexually forming proper spores, Akanthomyces pistillariformis reproduces asexually through conidiospores. Since a couple of years the taxonomic rules have changed and now the two forms must have the same name. 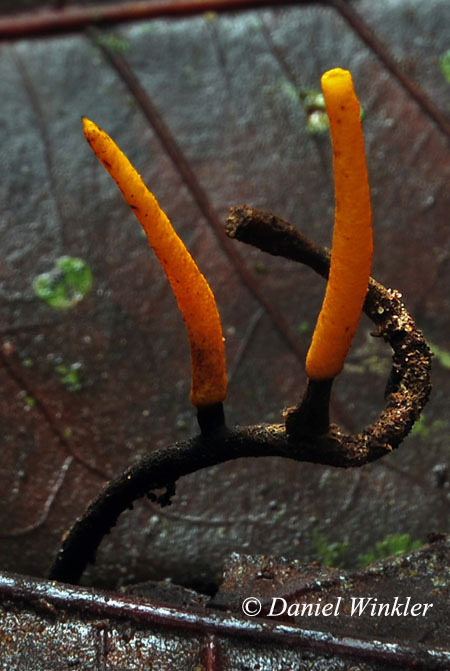 The stroma of Elaphocordyceps capitata, recently renamed to Tolypocladium capitata. Some entomophagous fungus, could be anything from a Beauveria to a Paecilomyces seen near Asheville. 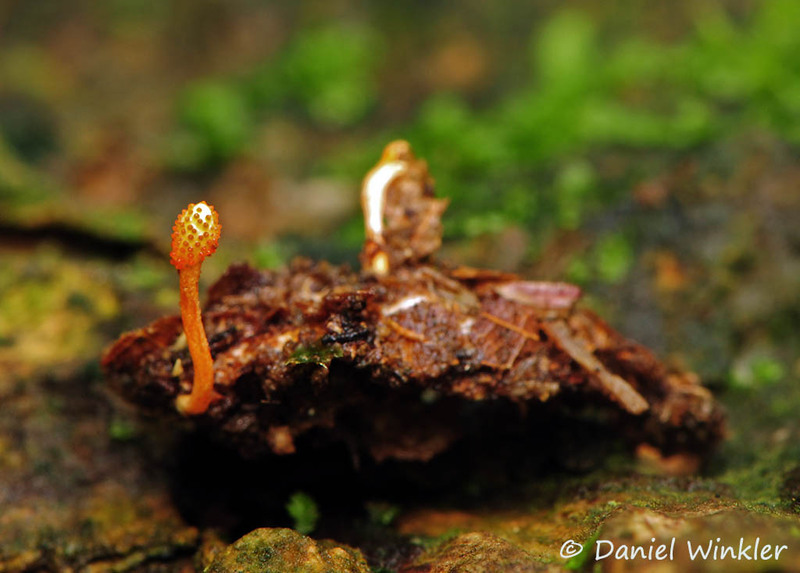 Ophiocordyceps stylophora is a tiny Cordyceps that is easily overseen. Todd Elliot, an expert on Southeastern North American Cordyceps, showed me this specimen in his backyard. Todd thinks it is very under reported, primarily because of its small size, dull color, and infrequent maturation. 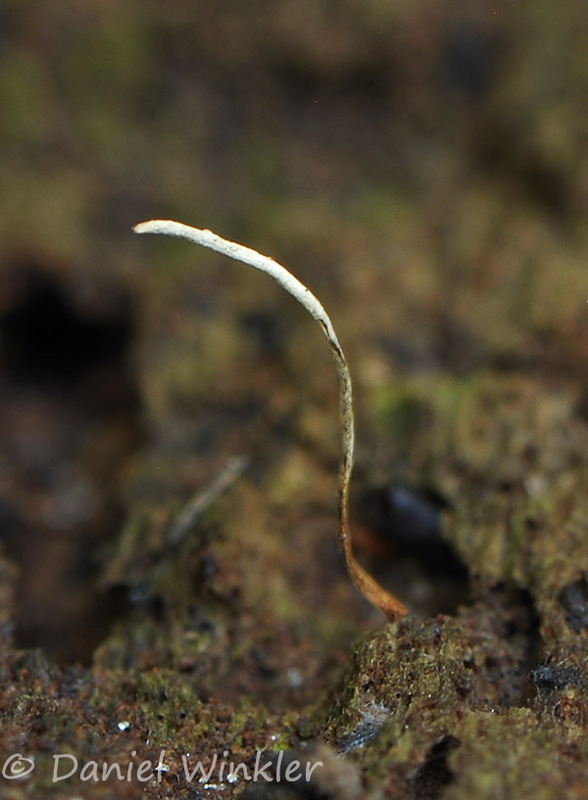 The same immature Ophiocordyceps stylophora dug out. It's stroma is growing out of a tiny coleopteran larva. And another entomophagous fungus found near Asheville. It could be an anamorph, but the more yellow tissue in the middle could be part of maturing perithecia. 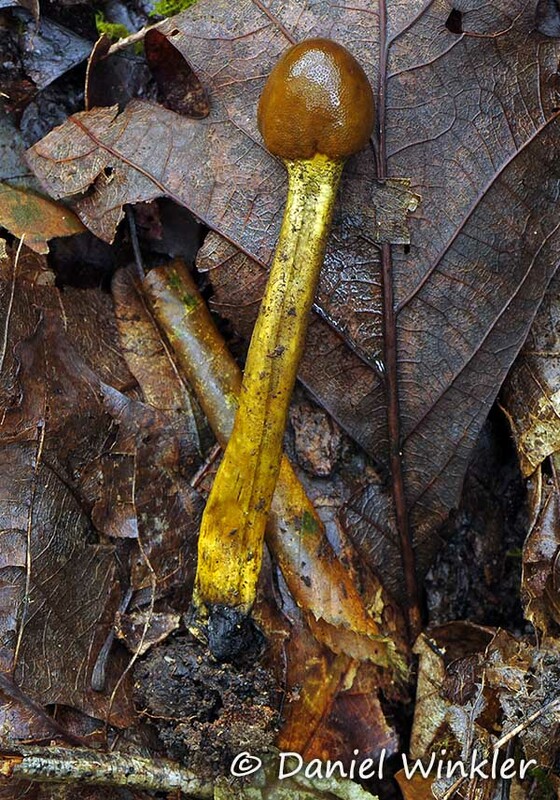 Armin Weise taking pictures of a Cordyceps in the woods near Asheville NC. 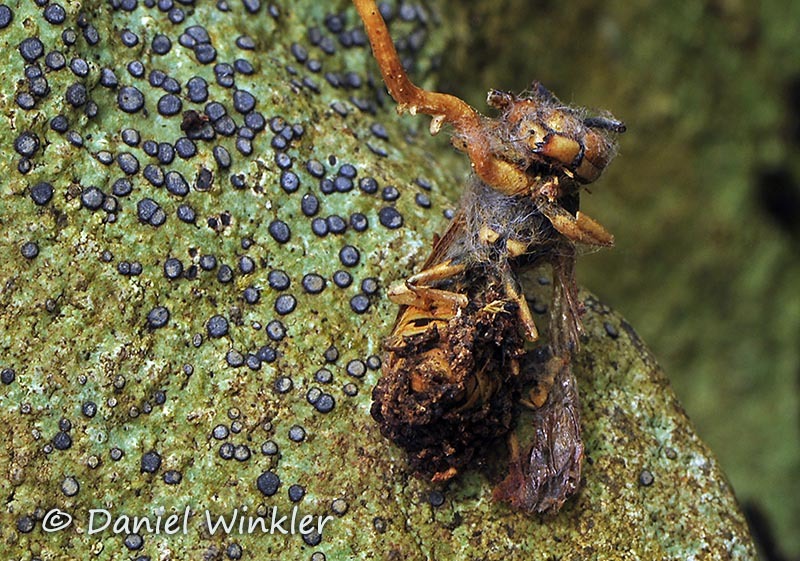 Ophiocordyceps unilateralis group, a long dead, fungally parasitized Zombie ant in Tradd and Olga Cotter's backyard. 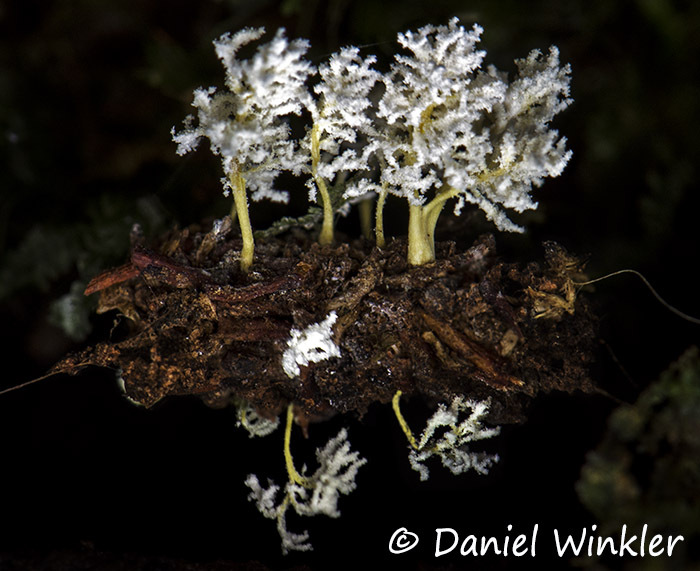 I was all excited seeing a new species of Cordyceps, but alas no insect on the base, just mycelium in wood, thus no Cordyceps and probably Podostroma alutaceum. Other fungal highlights from the Carolinas trip as this stinkhorn below are published on my Mushroaming blog. Pseudocolus fusiformis, an introduced stinkhorn gone wild in Eastern North America, Asheville NC. Arsenic in wild Cordyceps products? An interesting news bit that suggests Ophiocordyceps sinensis products made from wild crafted Yartsa gunbu have an high arsenic concentration. This is only a news report and I hav enot seen the original research. Definitely an issue that needs some following up. Products derived from rare ingredient from Tibet found to contain up to 10 times the national limit of arsenic, officials say. Cordyceps, or caterpillar fungus, one of the most sought-after and expensive ingredients in traditional Chinese medicine, has been deemed a danger to human health by China’s main food and drug regulator, mainland media report. A recent examination by the State Food and Drug Administration showed that products derived from the fungus, such as powders and tablets, contain excessive arsenic, Chinanews.com reports. The national standard limit for the toxic chemical is 1 milligram per kilogram, but the level found in the supplements ranged from 4.4-9.9mg/kg. Consuming the products over a long period increased the risk of the element, a common poison, accumulating in the body, the authority said. Cordyceps are the fruiting bodies formed after fungus parasitizes the larvae of ghost moths found in mountainous regions of Tibet and Nepal. They make expensive gifts, often given to old people, and are believed to strengthen a person’s immunity system and restrain the development of cancer cells. 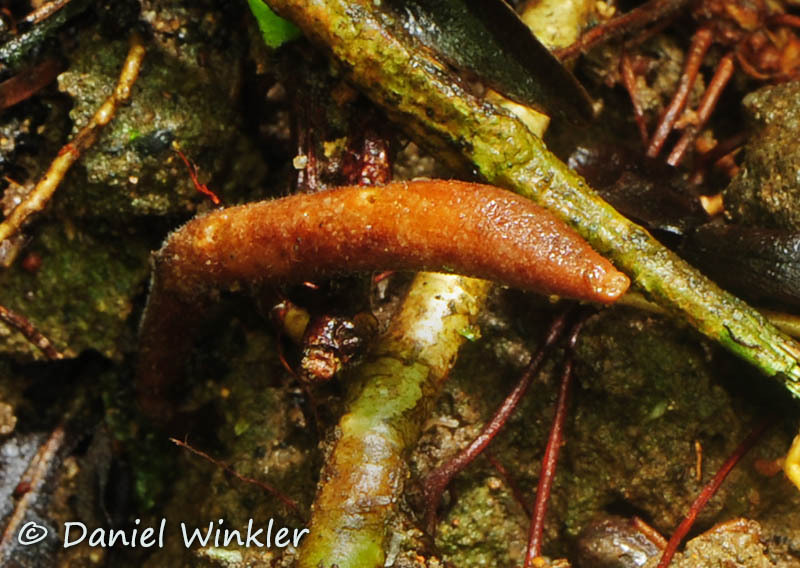 Below the images of Cordyceps and allies we encountered during the April 2015 Mushroaming Colombia tour. 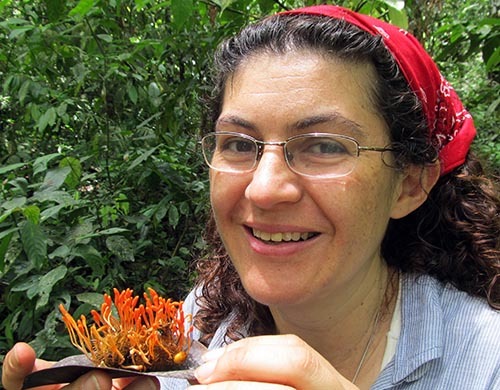 Special thanks to our expert Colombian guide Dr. Tatiana Sanjuan, a specialist on neotropical Cordyceps. 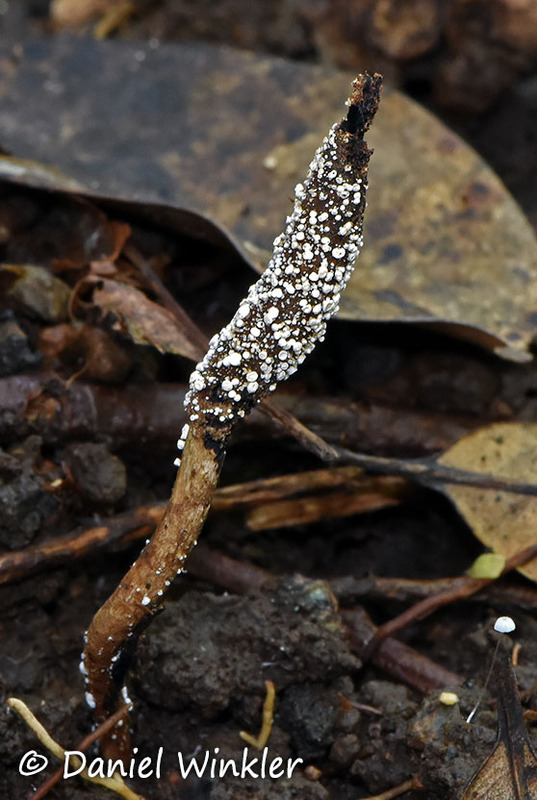 A Cordyceps species close to Cordyceps militaris. 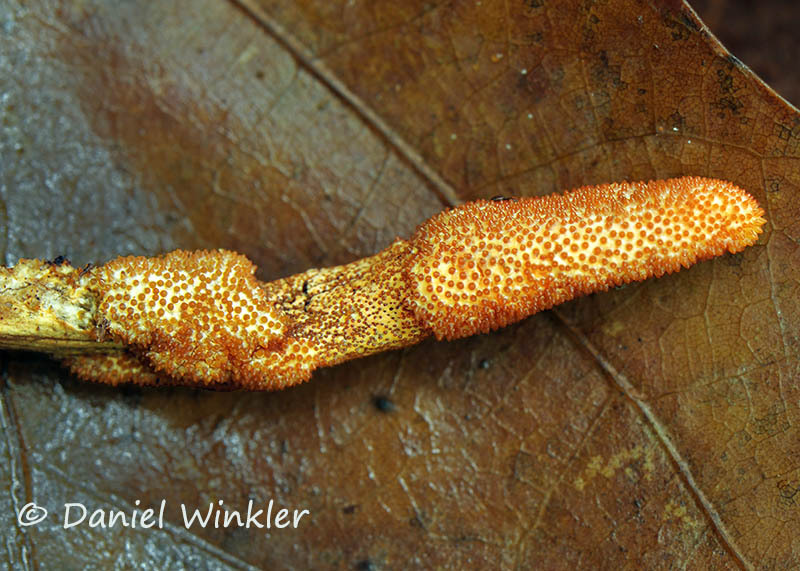 This Cordyceps grew over 50 stromata (=fruiting bodies) out of this giant beetle larva (10cm+) seen in Rio Claro, Antioquia, Colombia. A Moelleriella sp. teleomorph. 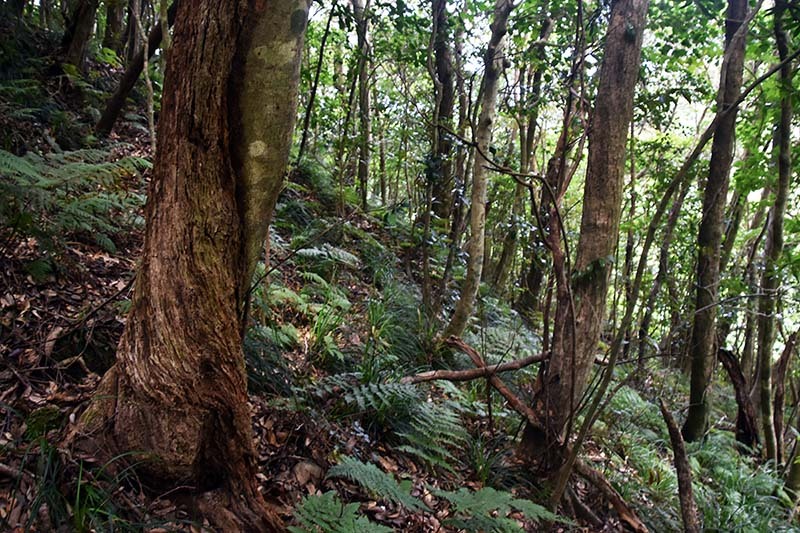 Its anamorph looks similar to an Aschersonia (see below). Moelleriella is an entomophagous fungi in the Clavacipitaceae family, famous for containing ergot, Claviceps purpurea. Moelleriella spp. are pathogens of scale-insects and white-flies (incl. aphids). Here it grows its fruiting body right around the devoured insect. A detailed paper on Moelleriella and associates can be found here. Aschersonia sp. 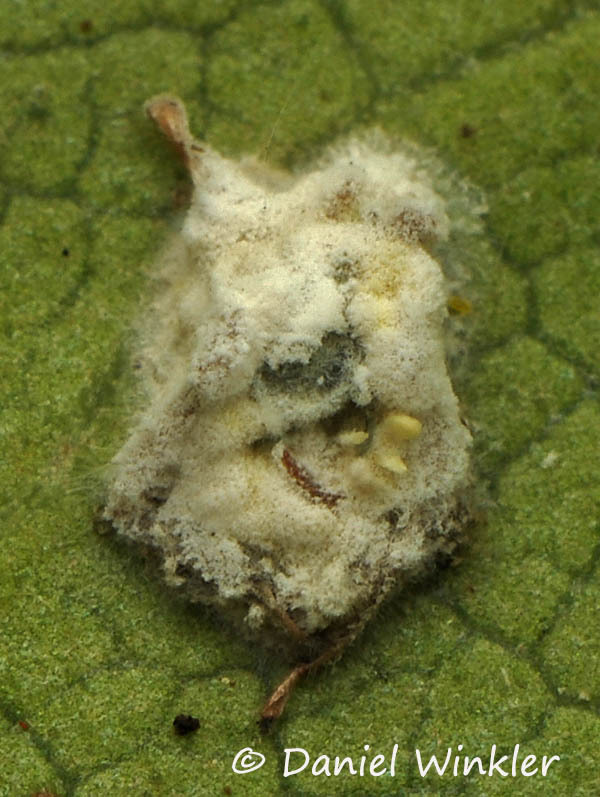 is another entomophagous fungus that is feeding on tiny Hemiptera insects, like aphids and leaf hoppers. A close up of another Aschersonia species. Using DNA sequencing it turns out some Aschersonia species are the anamorph of Moelleriella, some of Hypocrella, something that needs to be straightened out. 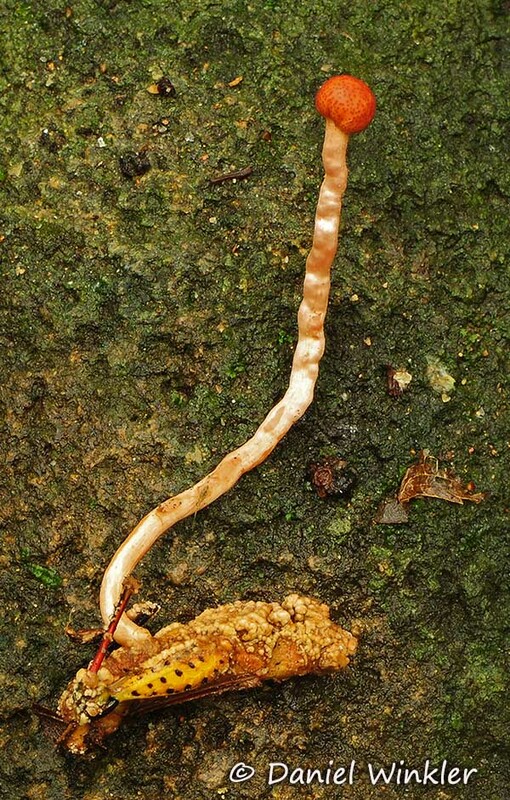 The long-dead Ophiocordyceps unilateralis gr. 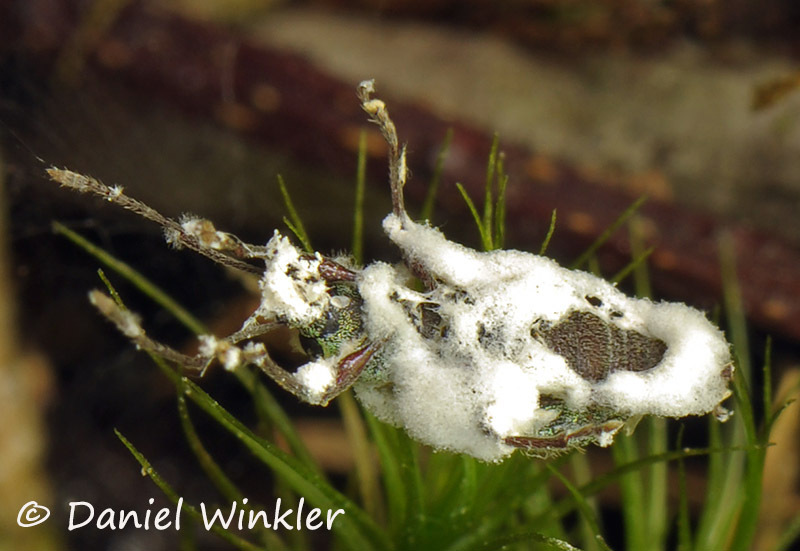 fruiting body growing out of the Zombie ant is already grown over by an algae. 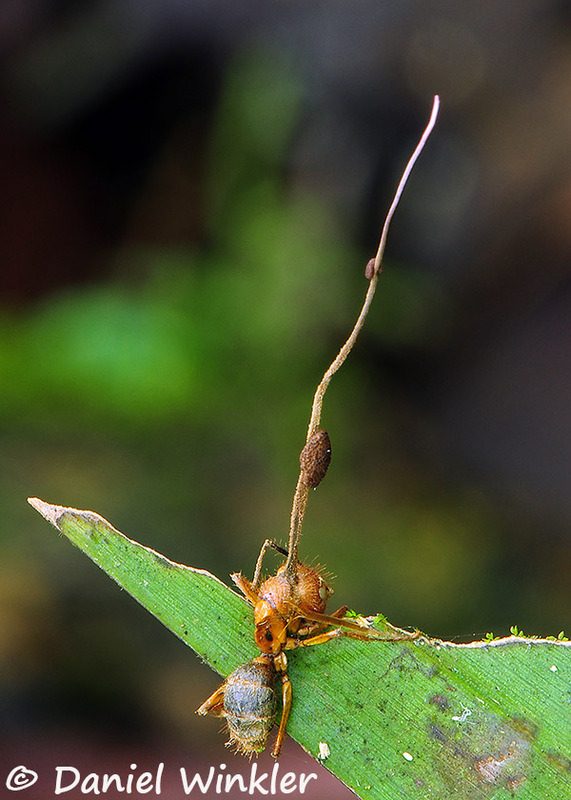 A much fresher Zombie ant (Ophiocordyceps unilateralis gr.) in its last resting position. 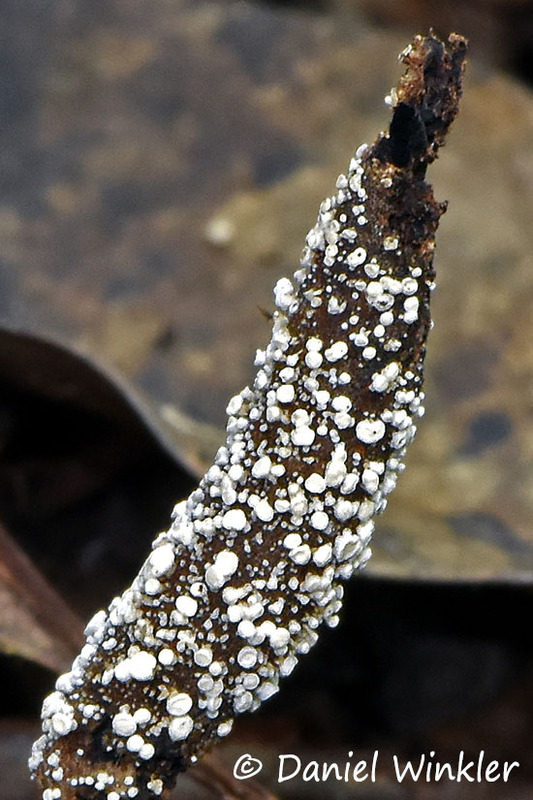 The cordyceps infected the ant and made it climb up to the end of a palm frond where it makes the ant bite into the frond tip. Then the fungus dissolves the tissue that would normally open the mandible of the ant, thus the ant is well secured in this exposed location. At this point the fungus having abused all kinds of ant behavioral patterns for its own agenda finally kills its "host". Now the fungus will start to grow its fruiting body digesting the ant as its source of nutrients and finally producing spores to be spread from this perfect elevated location to hopefully land on the next unsuspecting ant. 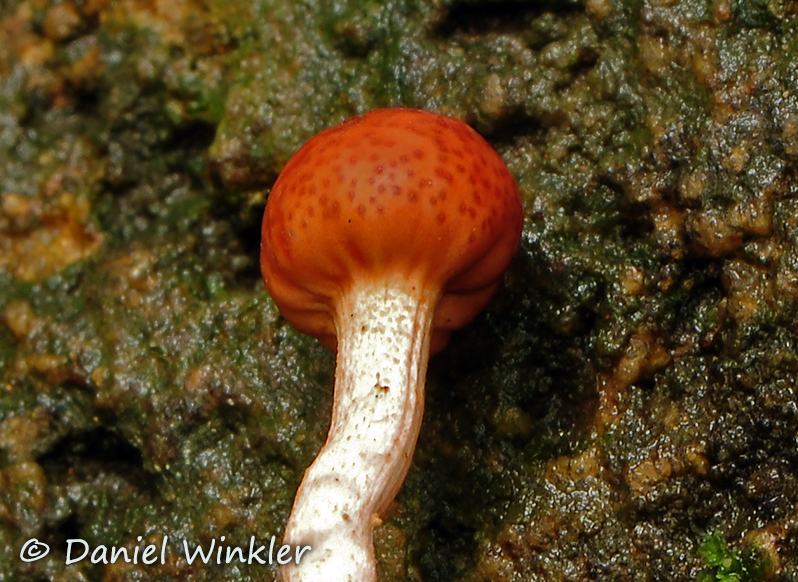 Seen in Rio Claro, an awesome marble gorge that is very rich in Cordyceps diversity. 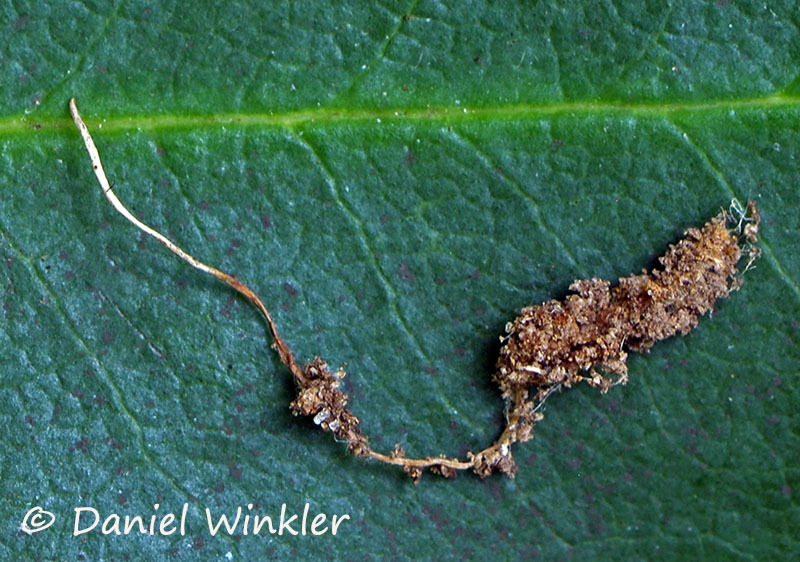 Lateral view of the fertile head of an Ophiocordyceps amazonica. 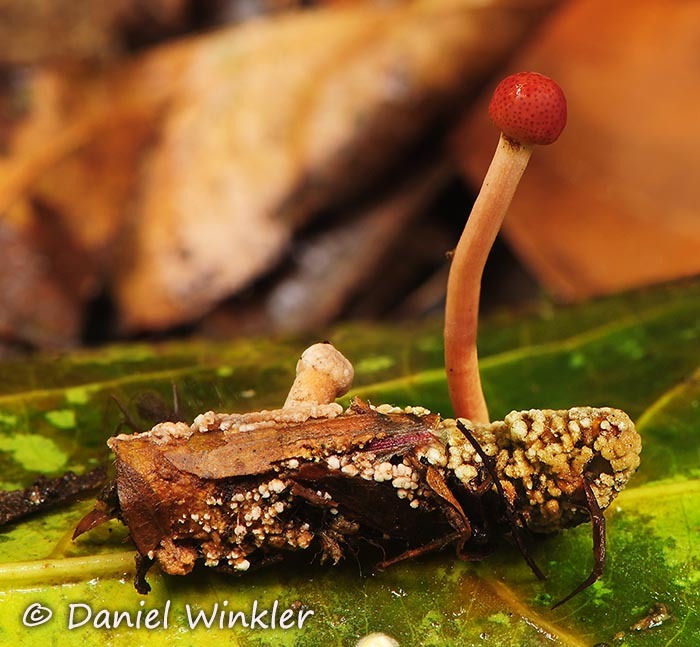 Cordyceps tuberculata fruiting on a Saturnidae moth in Rio Claro. 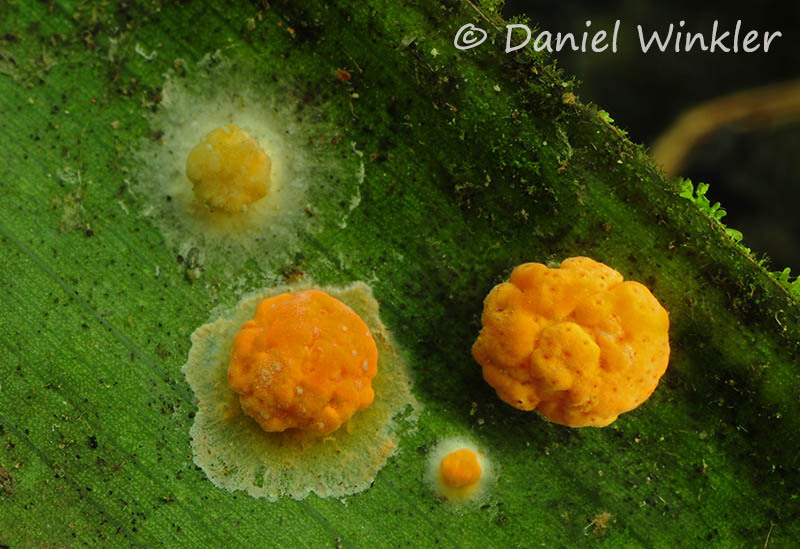 The yellow tissue are the perithecia in which the spores are produced. 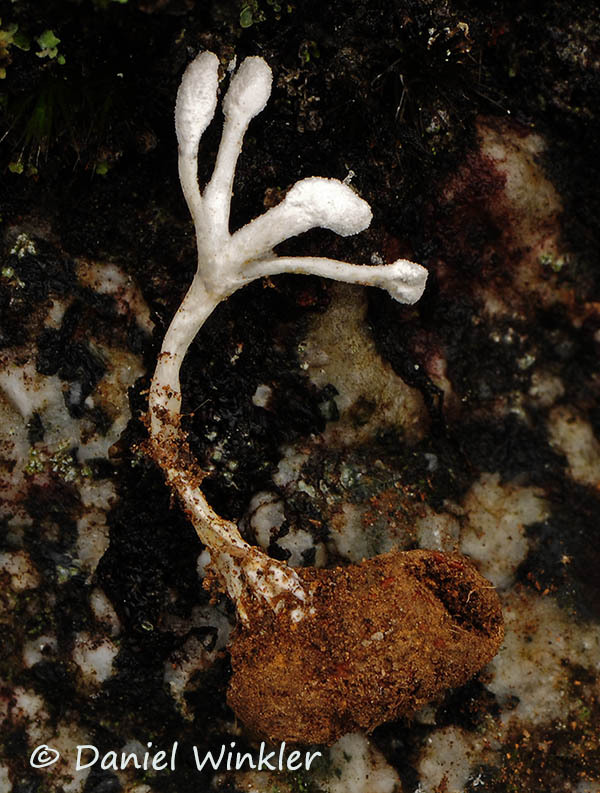 The anamorph of C. tuberculata is Akanthomyces pistillariformis.This is predominately teleomorph form, but the few white longish structures should be the synnemata of the anamorph. Evlachovaea sp. also known as Isaria sp. is an anamorph. We found a dozen in Parque Arví above Medellin in around 2600m. Don’t get caught with mushrooms or plants growing in your gutters. LeafFilter can help. 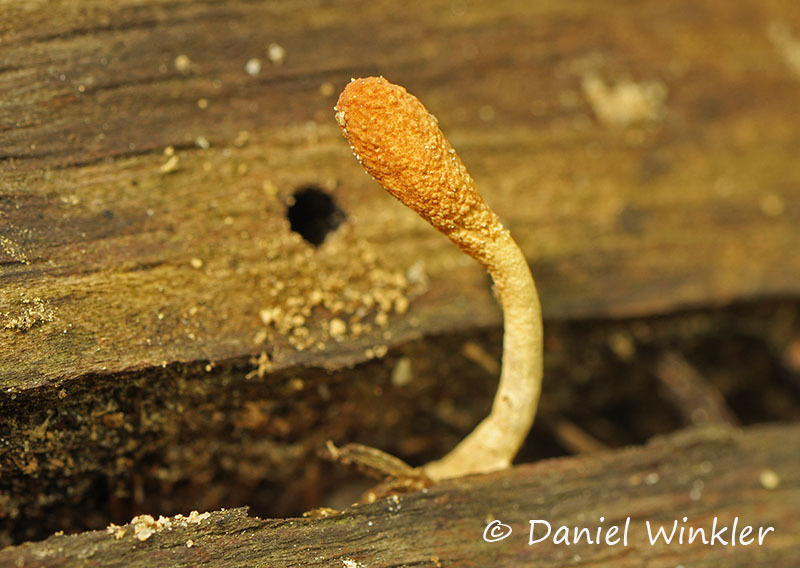 A tiny Cordyceps, maybe Cordyceps submilitaris, but we are not sure. 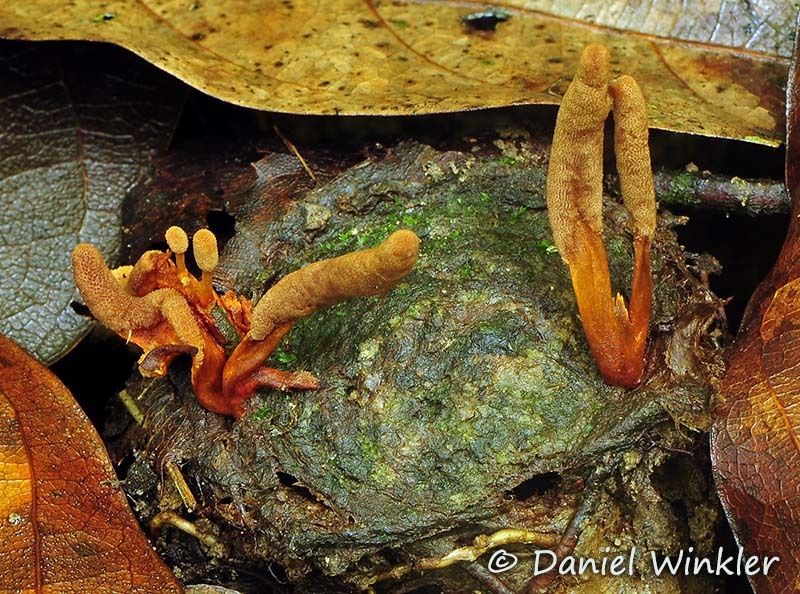 Overmature fruiting bodies of Cordyceps nidus coming out of the lid of a trapdoor spider hide-out. That spider is not opening that trap door again, but the wicked fungus is shifting the spider biomass above ground in its pursue of reproduction. 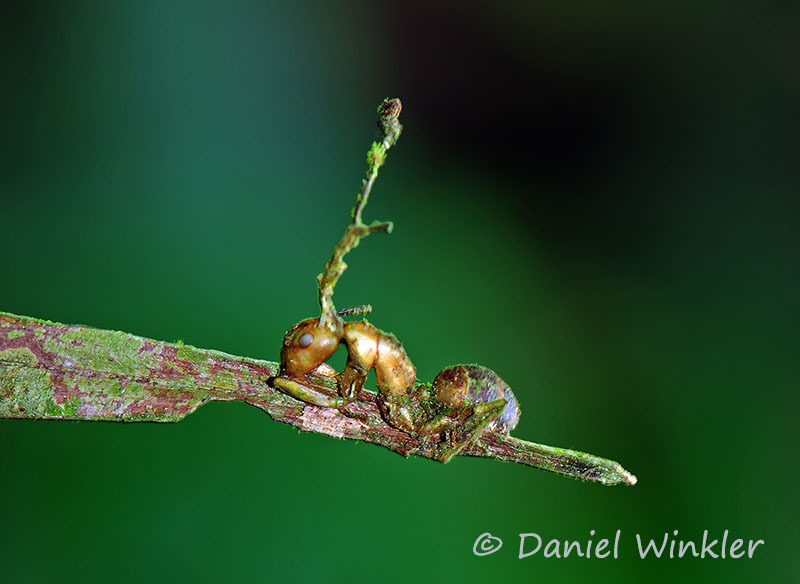 Two ants killed by Ophiocordyceps unilateralis group closely embracing each other. 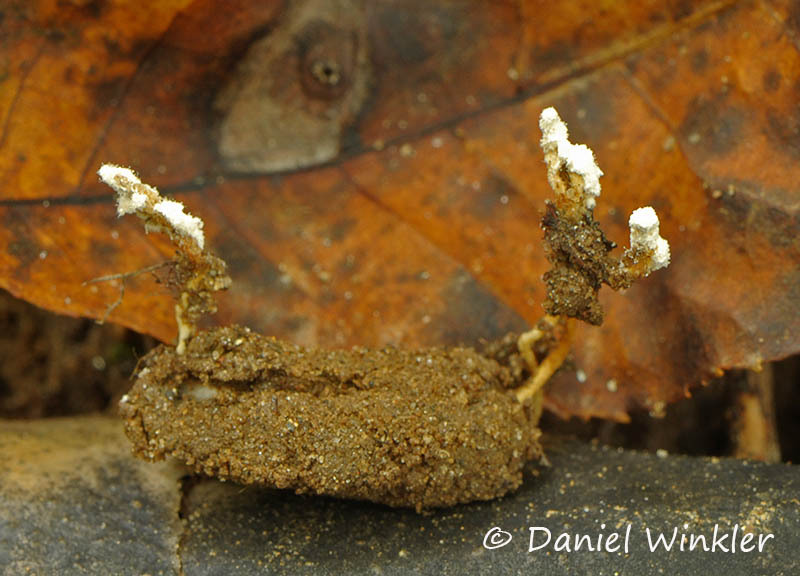 Maybe an Ophiocordyceps growing from a buried cicada larva, which I was not able to excavate. 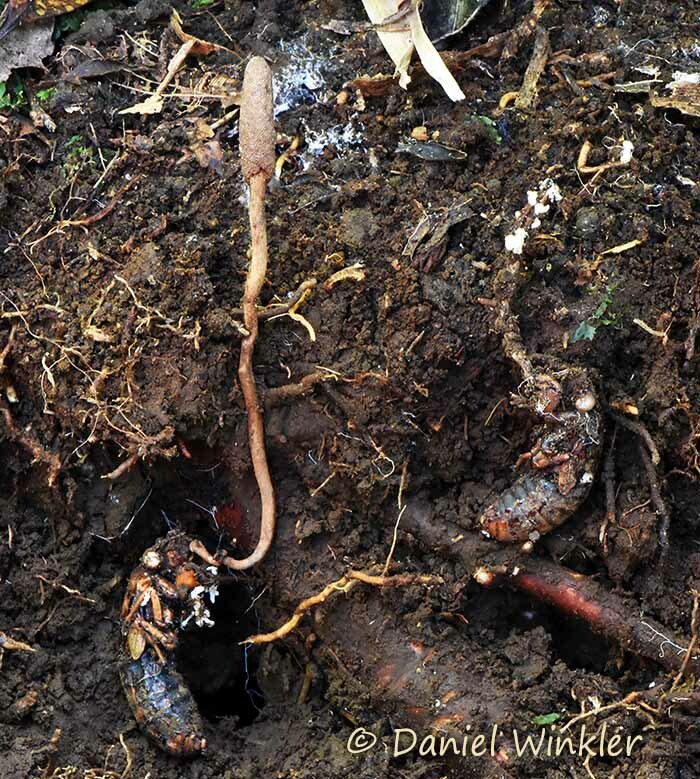 Isaria tenuipes, a Cordyceps anamorph we found buried in wood. Podostroma, the "bane" of every Cordyceps hunter. 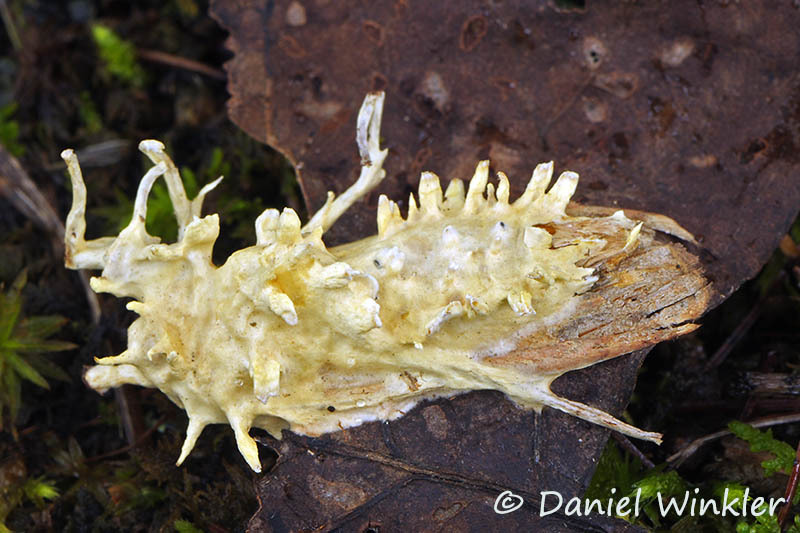 The fruiting bodies just look like a regular Cordyceps, but Podostroma do not parasitize insects, but decay wood. The genus Podostroma contains about a dozen widely spread species. 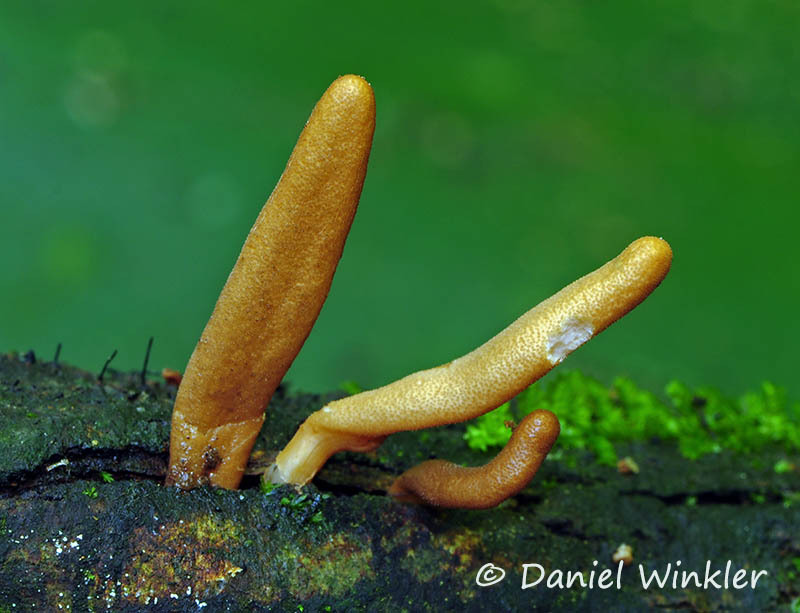 They are related to Cordyceps, they are in the order Hypocreales, to which also Cordycipitaceae and Ophiocordycipitaceae belong. However, latest taxonomic reviews placed Podostroma in the genus Hypocrea, with anamorphs known as Trichoderma spp.. Alas, due to changes with in the code of nomenclature, the genus Trichoderma has been proposed for conservation over its teleomorph Hypocrea, thus this Podostroma is now referred to as a Trichoderma.